If you're a gaming enthusiast and enjoy new releases as well as older titles, you might want an efficient way to download and play classic games on your computer without tweaking an endless row of settings. Beamdog is one of the applications that can help you achieve quick results in the situation depicted above since it lets you acquire content and manage it with ease. 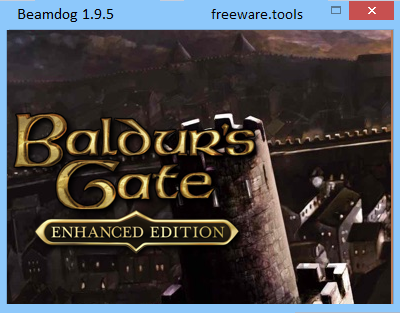 In other words and simply stated, this allows you to acquire classic games from the Beamdog store and manage your collection on your computer by turning to this handy software solution. For all your gamers out there, this certainly is a must-have piece of software. It goes without saying that you need to be connected to the Internet and have an account before you can use this application's functions accordingly. You can register an account on the spot, but need an external browser to do so. After you log in, you can notice that your game library is probably empty, but you can acquire new contents by browsing the "Store" menu, buying the desired title and downloading it to your PC. Since Beamdog is oriented towards classic games, you can only find a bunch of titles in the store section that are filed under the "RPG" category and are part of the "Baldur's Gate" collection. Therefore, the content you can acquire, for now, is limited to these releases only. However, although classics, the games have been optimized so that they work on newer systems without triggering compatibility issues. The principle of this app is as simple as its interface. You log in, buy games and launch them directly from the app. No chat system or additional services are available. A few stats are displayed in the main window's status bar including the download rate, overall progress, library size and free space. Furthermore, the app comes with a simplistic configuration section that can be accessed by pressing the "Settings" button. Here you can toggle interface and download options, manage your account and specify the download locations. Note that you need Administrator rights to edit the download locations. All in all, if you are a fan of classic games and want to play them on your PC without considerable efforts, you might want to try Beamdog. Although it supports a limited number of titles, they are optimized for newer systems. More so, its interface is simple and doesn't include additional or complicated features.